As with all types of junctions, roundabouts represent one of the biggest hazards to motorcycle riders. Statistically, most road accidents occur near or at junctions. As a motorcycle rider you’re vulnerable – you’re not surrounded by sheet metal and airbags. So as a rider, it’s not only essential that you consistently assess and improve your own riding skills, but learn to assess other road users and to the best of your abilities try to predict their actions. This might sound impossible, but with practice and experience, it can be achieved to a certain extent. That level of prediction comes only with experience, but we can make ourselves and other road users safer by understanding the fundamental hazards that occur daily at many roundabouts. There’s often many hazards to observe when approaching a roundabout. Always look well ahead for potential and developing hazards. Be cautious around erratic drivers – those that look like they’re in a rush and are less likely to be paying attention. Drivers that are lane jumping, cutting in or straddling lanes to get ahead may be oblivious to a motorcycle to either side of them. Stay on the safe side and keep clear of them. Pedestrian crossings are often located very close to roundabouts. Always observe road signs, there may be an advance warning sign informing you that a crossing is ahead. At quieter roundabouts, you may see zebra crossings. 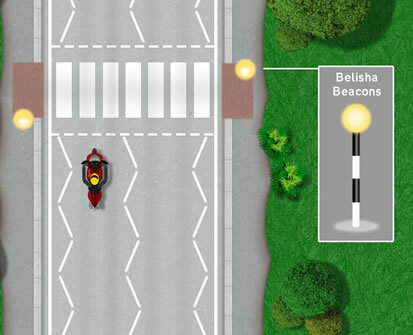 Look out for the flashing amber lights called Belisha Beacons that warn road users that a zebra crossing is ahead. As you get closer, look out for any pedestrians approaching the crossing and prepare to stop. At busier roundabouts, you’re more likely to see light controlled pedestrian crossings such as pelican and puffin crossings. 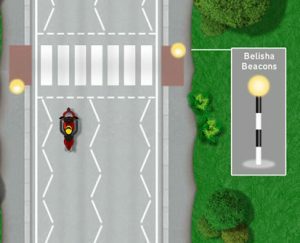 As you approach, look for pedestrians waiting at the crossing and if there are waiting pedestrians, this indicates that the lights on the crossing will change very soon. 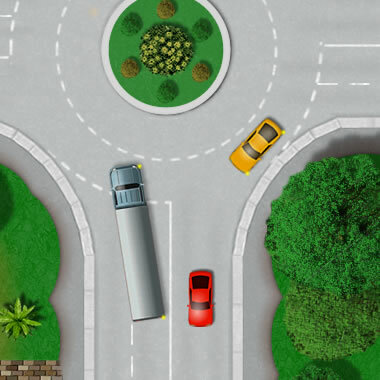 Because of their size, long vehicles often must take an alternative path before making a turn. A long vehicle may need to straddle lanes to avoid mounting pavements for example. Give them plenty of room, keep behind and avoid riding in the drivers blind spots. Always be prepared for unpredictable drivers. Quickly alternate your observations from traffic to your right on the roundabout, to what’s going on ahead. You might expect the vehicle in front to continue if the roundabout is clear, but keep a safe stopping distance and be prepared to stop just in case they unexpectedly do. In particular, hectic, busy roundabouts represent a significant hazard for motorcycle riders. Some drivers may change lane and cross your path unexpectedly. They may do this in an attempt to gain a place or realise that they’re in the wrong lane and correct themselves with little consideration for other road users. Keep a look out for signals on vehicle making last-minute lane changes and try to avoid driving in drivers blind spots. Be cautious around long vehicles on the roundabout as they may straddle lanes due to their size. These road users often keep to the outside of a roundabout, even if they’re turning right. Give them room and be prepared for them to possibly cross in front of you, just as you’re exiting the roundabout. As with approaching a roundabout, there may be pedestrian crossings. If possible, try to establish any exit hazards such as traffic congestion and pedestrian crossings well before you reach your exit. When riding on an inside lane, always perform a ‘lifesaver’ glance before crossing into the next outer lane to ensure there are no vehicles that you’re crossing into.